FS740SFM, Jumbo Steel String Guitar from Yamaha in the FS series. And How About When Standing Up? The sun is shining and the air is warm. Nice weather to sit down on the terrace, open the cardboard box and there it is... It's small, it's new and it's beautiful! Its half-jumbo size in vintage sunburst finish recalls the Gibson LG01 from the 50's and 60's, clandestine bars, cigar smoke, and blues players. It's time to stop staring at it and put my hands on it. It feels very pleasant. The frets are not too thick and make chord playing much easier. The Nato neck with faded finish feels very smooth. It's thin, round but not too thick, which is convenient for people with small hands and women. 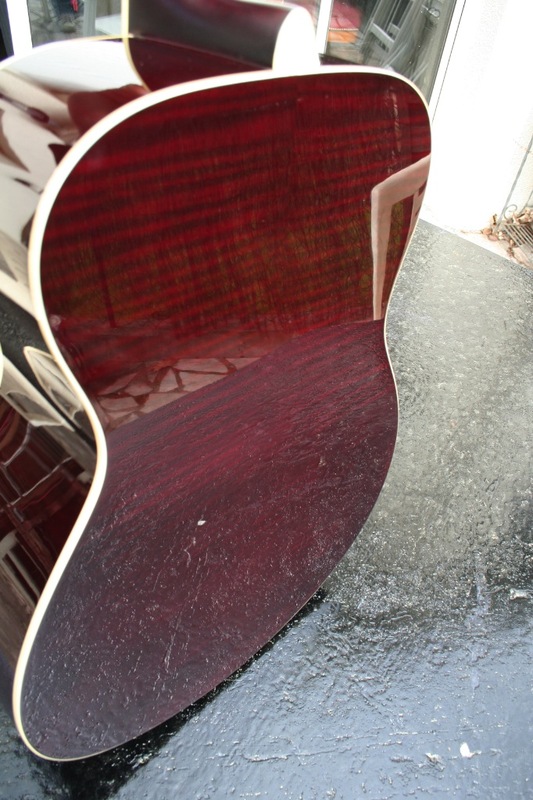 The guitar is provided with premium anti-rust Yamaha strings that are ideal for sweaty hands. The rosewood fingerboard features small pearly dots that emphasize the slim shape of the neck with standard scale length (650 mm / 25.6"). Nato comes from the Malay "kavy o", which means hard. This is a sacred wood from Madagascar that can also be found in Hawaii and in South Carolina, where our Yamaha guitar comes from. The wood is similar to mahogany but it is more flexible. In the USA, it's called eastern mahogany. It is frequently used for guitar and ukulele manufacturing. Unfortunately, it reacts badly to temperature changes, so it's not recommended to play it outdoors on a cold winter evening and then go back home and put it next to the chimney fire. 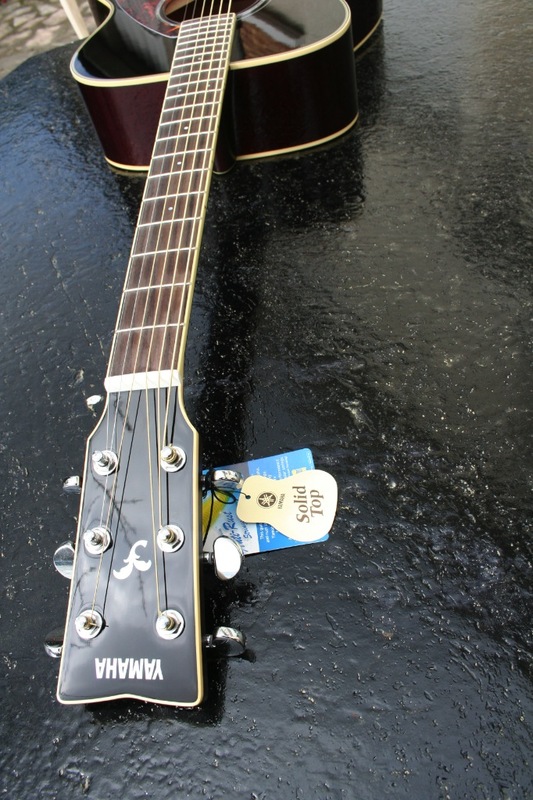 The guitar is equipped with sealed lubricated tuners. They are not awesome but stay in tune. The small body matches different styles of playing. The instrument is rather light and its shape naturally fits the body in sitting position. The lacquer has been properly laid on. The rosette with thin abalone inlays and the small turtle scale pickguard give a classy look to the instrument. Aesthetically speaking it is the mix of two different influences: vintage body and modern neck with satin finish, which is quite pleasant. The massive spruce top is equipped with an X bracing initially developed for the L series. The back and sides are made out of flamed maple. The result is crystal-clear high frequencies, strong mids and an excellent sound definition. The balance of the tone is just perfect. The instrument breathes! With a pick, it sounds big, powerful and well defined along the full frequency spectrum. When finger picking its precision is a blessing. To me, this guitar sounds best in finger picking style. We noticed a slight lack of low frequencies due to the woods, but it doesn't affect the overall sound balance at all. Moreover, spruce needs some time before actually giving a guitar all its tone richness and it also changes throughout the years. Time has come to record this beauty. I used a single Audio-Technica microphone placed in front of the rosette and connected it directly to the sound card of a computer. I first played some rhythm parts with a pick to check the attack, then changed to finger picking to play arpeggios. Since I like instruments with king-size body, I usually play sitting down. But considering the compact size of this Yamaha, I took a strap and stood up. It feels pretty good since it's light and not bulky — almost like holding an electric guitar. You can move your body and dance without the fear of hitting something. But then suddenly hit me and made me sad: I can't plug it into my amp. Of course, it's not such a big problem because it is very loud and it can be equipped with a piezo pickup. 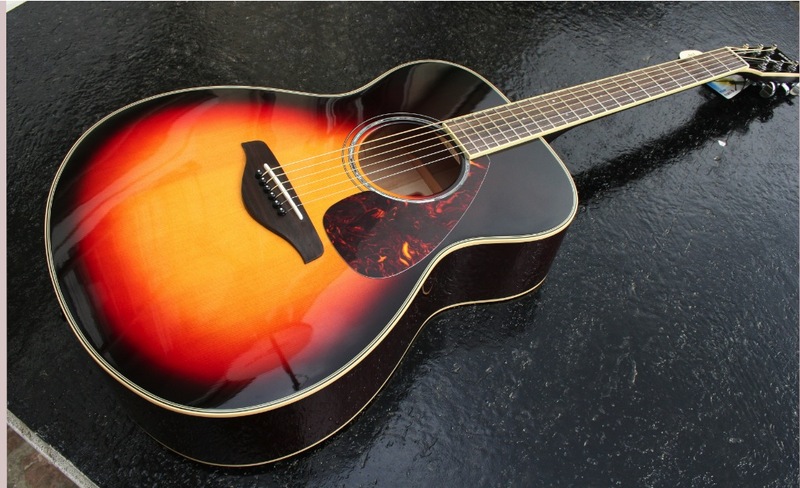 As a conclusion, I would say this is a very good acoustic guitar in terms of manufacturing and finish quality. 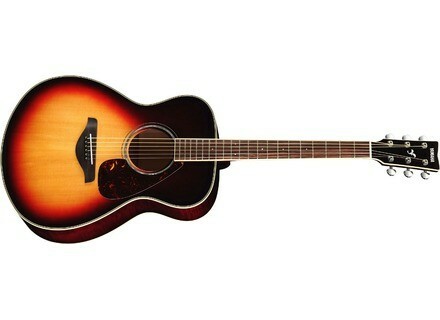 The instrument is available in three versions: natural, vintage cherry sunburst and vintage sunburst. It's a pity that the guitar is sold without a gigbag. The instrument will fulfill the needs of both beginners and experienced musicians. Its playing comfort and loudness give you a lot of flexibility, which is what most people expect from an acoustic guitar, right? We all want a guitar we can play anywhere, anytime to write new songs and play music just for fun.